I came across this on a local craig's list post in Michigan. I thought you might be interested. Keep up the good work! The Kalamazoo bass, or KB (sometimes referred to as KB1), arrived in 1966, as a companion model to two Kalamazoo KG guitars that had been launched a year earlier. Modern styling in solid-body 4-string bass that offers full, true bass tones in a sleek, rugged economically priced instrument. With one pickup of extremely powerful design and full volume and tone control, the Kalamazoo Bass creates the full driving bass sound that sells a combo. The vintage Kalamazoo-brand bass guitars are perhaps not that well known outside the United States, due to their short production time (just a few years in the mid 1960s) and the lack of endorsement by well known musicians; however being made by Gibson, in the USA, out of genuine Gibson parts meant that they were better instruments than many in the same price range. Good condition examples can change hands for reasonable sums amongst vintage guitar enthusiasts, and players alike. There were two body shapes - later models are SG shaped (have a closer look at a 1967 KB bass), but the majority are more like a Fender Mustang (see a 1966 KB bass). They have a bolt-on maple neck; something that Gibson (up until this point) didn't do, rosewood fingerboard, and were short scale. There were two subtley different headstock shapes, the first again suggests Fender, though a bit rounded off - the second has the characteristic 'beak' and is almost identical to that of the non-reverse Thunderbird (see images below). The Kalamazoo logo is engraved on the headstock. This bass used some standard Gibson components; a typical EB series humbucker right up at the neck, as used in the EB0, EB2, EB3, Melody Maker bass and Epiphone Newport This pickup in this position, has more affect on the sound than anything else. This bass does sound quite a lot like an EB0. Tuning keys are the Japanese-made closed keys that were also used on the Melody Maker bass and a few EB0s. The bar bridge had been in use on all bass models, but around 1966/67 this was replaced by the two-point intonatable bridge. From this point, the KB bass was the only one using these bridges - likewise the only one using the old-style (and position) chrome handrest. 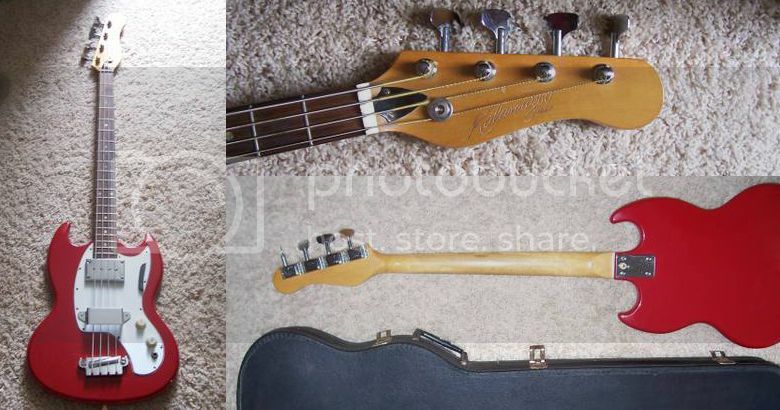 The scratchplate is almost identical (except some minor screw hole differences) to the Melody Maker bass, but the fingerrest is not rosewood as on all Gibsons, but actually plastic. The body material is not specified in Kalamazoo literature, but is supposedly a wood-laminate of one or more unspecified species, produced by a toilet-seat manufacturer in Wisconsin. There were three colours: Flame Red, Glacier White, and Las Vegas Blue. These were not the expensive nitrocellulose finishes applied to Gibsons, but again catalogue descriptions are not specific, perhaps some form of polyurethane? Kalamazoo, rather than Epiphone was Gibsons Budget brand. A common misconception about Epiphone is that its 1960s guitars and basses were cheaper imitations of the Gibson lines. This is simply not true. From the late 1950s until 1969 Gibson and Epiphone instruments were made side by side at the Kalamazoo factory in Michigan, using the same woods, techniques and components. The purpose of the Epiphone range was to continue to provide Epiphones high-end instruments; those that had been Gibsons competition, and to circumvent certain supply agreements (Gibsons protective territorial policy). There was actually a waiting list to become a Gibson dealer, and to avoid upsetting existing dealers, Gibson was able to offer its (almost identical) Epiphone models to newcomers. Currently being offered for sale on Craigslist in Michigan for $650. I had one of the Mustang-style Kalamazoo guitars. It was a poor quality instrument, bad components and some kind of composition body which screws would strip out. Not in the Epiphone class at all. IMHO worth about $65. I've seen quit a few of these guitars and basses, living about 4 hours south of Kalamazoo. The bodies basically were made of plywood. They made great entry-level instruments! People part them out a lot to restore higher-end basses of the era. "The body material is not specified in Kalamazoo literature, but is supposedly a wood-laminate of one or more unspecified species..."
The body's are made of particle board. Whatever you do, don't get it wet! I've not seen one made of plywood. To Jake and g downs, you are right about the bodies being made of MDF and not plywood. That's what I get for multi-tasking. Look on thE bay, and you usually will see at least a few of these tail pieces for sale. No, particle board, not MDF. There's a big difference. MDF didn't exist when this guitar was made. Just trying to be clear ... said the invisible man. LOL!